As we look beyond the 2016 election season, there seem to be three prospects for the partisan makeup of the federal government next year. One outcome will look quite familiar to anyone who has followed politics over the past several years: divided government led by a Democrat in the White House. Another possibility: One-party rule by a Republican Party in the midst of serious fractures under the leadership of a very nominal Republican. The least likely scenario also involves one-party rule, but instead by the Democrats. To the extent that the new president will be able to get any big-picture agenda item accomplished, that person will almost certainly have only a limited time to act, because the 2018 midterm election will be looming just around the corner, carrying with it the potential to deal a debilitating blow to the president’s party. Hillary Clinton may have a hard time uniting the Democratic Party, particularly winning over younger voters who supported Bernie Sanders in the primaries. Despite the potential for splits in both parties, this presidential race is being contested in an era of intense party loyalty. Hillary Clinton may have a hard time uniting her party, particularly getting younger, less reliable Democrats to the polls, a large majority of whom were smitten with the more liberal Bernie Sanders. However, Democrats unified to a great degree after the closer and arguably more divisive 2008 contest, which Clinton lost. Barack Obama still ended up winning about 90 percent of Democrats in the general election. A factor in Clinton’s favor is that despite some policy similarities between Donald Trump and Sanders—most notably their criticism of free trade—Trump’s hostility to immigrants and total lack of so-called “political correctness” is a combination likely to alienate young voters, who generally care very much about diversity (in part because they are the most diverse age group). Obama won the youngest voters (18-29) 60%-37% in 2012. Clinton could do just as well, if not better. Much of the Republican Party leadership dislikes Trump, but the party also quickly unified around him once the primary season ended. For instance, the party’s longest-serving senator, 82-year-old Orrin Hatch of Utah, called the 2016 election “perhaps the most important of my lifetime” and then proceeded to endorse Trump, a political neophyte whose brash style stands in stark contrast to the Senate’s President Pro Tempore. Meanwhile, public opinion polls showed Trump quickly capturing upwards of 80 percent or more of self-identified Republicans. Both Clinton and Trump likely need to get to at least 90 percent among their own party identifiers to win in November. Trump may yet have trouble getting over that threshold, but for him the early returns are promising. The partisanship that likely will define the presidential race should also bleed down the ballot. It seems likely that the winner of the White House will also carry the Senate, in large part because we are in an era of relatively high correlation between presidential and Senate voting and because most of the truly competitive seats in the Electoral College also feature competitive Senate races. In the run-up to Obama’s four-point national victory in 2012, the two presidential nominees (Obama and Republican Mitt Romney) held general election campaign events in just 10 states: Colorado, Florida, Iowa, Nevada, New Hampshire, North Carolina, Ohio, Pennsylvania, Virginia, and Wisconsin (and more than half of those events were confined to just Florida, Ohio, and Virginia). All but Virginia hosts a Senate race this year, and Republicans are playing defense in seven of those nine states (Democrats are defending only Colorado and Nevada). Presumably, the presidential winner will end up carrying the bulk of these swing states—Obama carried all but North Carolina in 2012—although they could split in the event of a very close election. Of the nine Senate races in these presidential battlegrounds, only one—Iowa—has an entrenched, veteran incumbent (Republican Chuck Grassley). The others are generally either open or feature first-term Republicans elected in the Republican wave year of 2010. The lack of deep roots for these incumbents suggests that a little bit of a presidential push in one direction or the other could tip the bulk of them in the same direction. Senator Chuck Grassley of Iowa is one of the few veteran Republican incumbents running for reelection in 2016. Republicans currently hold a 54-46 advantage in the Senate, so Democrats need to net four seats to tie (the new vice president would break that tie) or five seats to win it outright. Again, the presidential race could very well end up deciding the Senate because of the seats in play. The Republicans’ big House edge is more secure but not necessarily impregnable. Their 247-188 majority is the party’s largest since the one the GOP captured in the 1928 election, right before the Great Depression effectively closed the GOP out of the House for nearly all of the next six and a half decades. Democrats need to net 30 seats to win the House back: That seems unlikely, but a strong anti-Trump, pro-Democratic wave could do it. There certainly are historical precedents for an incumbent White House party winning another term and having coattails down the ballot: The Republicans netted 30 House seats in the aforementioned 1928 election, when Republican Herbert Hoover won a third straight GOP White House victory against Democratic New York Gov. Al Smith, the first Catholic presidential nominee. Smith performed quite poorly, although his candidacy laid the groundwork for the Democrats’ turn toward becoming a more economically liberal, urban-dominated party (for instance, his victories in Massachusetts and Rhode Island presaged the moves of both typically Republican but heavily Catholic states into reliably Democratic territory). When Herbert Hoover won the presidency in 1928 election, the Republicans rode his coattails to net 30 House seats. Another example is 1964, when Democratic President Lyndon Johnson won election in his own right after taking over for the assassinated John F. Kennedy. Democrats added 37 House seats to their already-large House majority thanks in large part to the poor performance of Republican nominee Sen. Barry Goldwater of Arizona. But just like Smith, Goldwater’s candidacy provided something of a preview for where the Republicans were headed: While there had been some indicators that the South had been moving toward the Republicans prior to 1964, Goldwater’s victories in several southern states that year provided a strong indication that the region was becoming more Republican. The lesson here is that weak presidential nominees, like Smith and Goldwater were in their respective elections, can wreak havoc down the ballot for their parties. Trump could do that to the Republicans, even while his campaign and performance might, also like Smith and Goldwater, point the way to new trends in American politics. Weak presidential candidates, such as Barry Goldwater who was the Republican nominee in 1964, can negatively affect other races while also pointing to new trends in politics. As we now look to 2017, let’s consider the first possibility mentioned above: Clinton wins and leads a divided government. Let’s assume, as is quite plausible, that the government looks much the way it did from 2011-2015: A Democratic president, a Democratic Senate, and a Republican House. What could we expect this government to accomplish? First, Clinton would likely be able to fill the vacancy on the Supreme Court. But it’s also possible that Republican Senate leaders, arguing that Merrick Garland will be less liberal than a Clinton pick, will allow a vote on President Obama’s nominee to the seat in a lame duck session following a successful election for the Democrats. It’s also possible that Garland could get a vote even earlier if Senate Republicans are feeling desperate after Labor Day and believe a vote on Garland would improve their odds to hold the Senate. Still, Republicans in the minority could also filibuster a Clinton Supreme Court selection for an indefinite amount of time. A President Clinton might be more adept at cultivating personal relationships with congressional leaders than President Obama was, which some observers believe hurt Obama’s presidency. But the larger problem—that of two diametrically-opposed partisan camps each holding power in Washington—would remain, and it’s doubtful that a GOP House majority would go along with any big-ticket Clinton proposals. For example, any gun control initiative—a Clinton focus during her primary with Sanders because it was one of the few issues where she could get to Sanders’ left—would likely be dead on arrival in the GOP House. Republican Senate leaders might allow a vote on Merrick Garland to fill the vacancy in the U.S. Supreme Court if they believe it could improve their odds to hold the Senate. There could be room for movement on another Democratic priority, immigration, although that too might be unrealistic. After the 2012 election, a Republican report on how to achieve future electoral success strongly suggested that Republicans needed to improve their standing with minority voters, particularly Hispanics. Assuming that Clinton were to win with the strong backing of nonwhite Americans—Obama won 80 percent of these voters in 2012, and Clinton could do even better against Trump—Republican leaders may feel even greater pressure to mend fences with these voters. That could prompt some Republicans, at least in the Senate, to go along with Democrats and pass a major immigration bill, as the Senate did in 2013, although some of the 14 Republican senators who supported the bill three years ago will not be in the Senate come 2017. (One of them is Sen. Marco Rubio of Florida, whose association with the immigration bill weighed down his failed 2016 presidential bid). In any event, it’s unclear whether the House would go along with an immigration compromise, and a Republican Speaker—be it Paul Ryan or someone else—would probably need many Democratic votes to pass the bill through the House. Would that Speaker have the gumption to do that, against the will of what likely will be a majority of his or her caucus? A major unanswered question in this scenario is how rank-and-file Republicans would react to the hypothetical Trump loss and the loss of the Senate. We know from public opinion polling, and from the outcome of the Republican presidential primaries, where candidates affiliated with the so-called “party establishment” did quite poorly, that Republicans dislike their leaders and prefer outsider candidates to insiders. Would that change after a third straight presidential defeat? Would the party base become less rebellious and acknowledge a need for moderation? The signals Republicans get from their own supporters in the aftermath of 2016 will guide their willingness to compromise with Democrats. One thing seems fairly clear, though, and it argues against compromise: Hillary Clinton is already unpopular, and Republicans will have political incentives to make her first two years miserable and unsuccessful so they can run against her in the 2018 midterm. 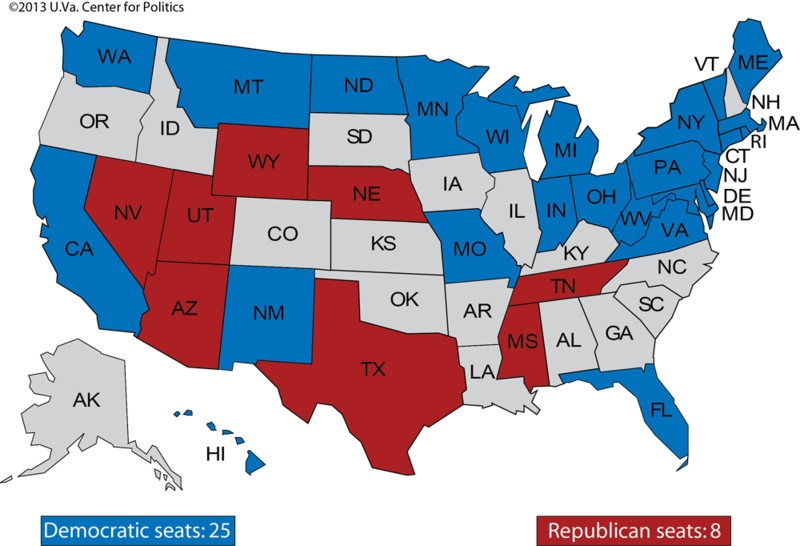 If Republicans lose the Senate in 2016, they should have an excellent chance to retake it in 2018: Democrats are overextended on the 2018 map, where they already hold 25 of the 33 seats up for election. That includes defending five seats in states that Republicans have carried in at least the last four presidential elections and that Trump is currently favored to carry as well: Indiana, Missouri, Montana, North Dakota, and West Virginia. Additionally, Democrats will be defending Senate seats in competitive swing states like Florida, Ohio, Virginia, and Wisconsin, among others. The president’s party has lost ground in the Senate in 19 of the 26 midterms held since 1914, the first election featuring direct election of senators across the country. The signals that Republicans, such as Speaker of the House Paul Ryan, get from their own supporters in the aftermath of the 2016 election will guide their willingness to compromise with Democrats. If Clinton wins the White House without carrying the Senate, the dynamic would be much the same as above, although Republicans would probably feel even more emboldened to battle Clinton because an election outcome like that would be more a repudiation of Trump than a repudiation of the GOP. The party would feel the same impetus to stymie Clinton to set up the midterm—a midterm that could allow Republicans to create a 2019 Senate majority approaching a filibuster-proof 60 seats—and a 2020 presidential election that Republicans would likely feel confident of winning in large part due to popular fatigue amongst voters after more than a decade of Democratic presidents. Additionally, history and other trends suggest that the nation is due for a recession at some point in the next few years. Economic troubles generally hurt the president’s party at the polls. The second possibility, a unified Republican government under President Donald Trump, is harder to handicap. However, we must assume that a presidential candidate running aggressively on particular proposals will try to enact them. For instance, it was no surprise to anyone watching the 2008 campaign that President Obama strongly prioritized an expansion of health insurance coverage, and that is what he and Democrats enacted in 2010, at the cost of a great amount of political capital. Political science research also indicates that, perhaps in contrast to popular belief, presidents generally at least try to keep their campaign promises. So, if Trump is elected, we should not be surprised if he tries to follow through on what he’s campaigned on, including trying to build a wall on the nation’s southern border with Mexico while attempting to get Mexico to pay for it by threatening to cut off the remittances that immigrants send to their home country from the United States. Whatever one thinks of the proposal, there’s little reason to think Trump won’t try to implement it, through Congress or perhaps by executive order. The Senate will also have to vote to confirm Trump’s Cabinet appointments, and it’s not a given that every nominee will pass smoothly through the Senate. Congressional Republican leaders would likely try to mold Trump in their own image, but not only is Trump a natural renegade, Congress would also be fighting against a White House that, in the long reach of American political history, has been growing in strength relative to Congress, not weakening. The chance of a conflict between the executive and legislative branches, even in a one-party Washington, seems real, and the possibility exists for a constitutional crisis. Military leaders, for example, might not follow certain orders from a Commander-in-Chief Trump, such as a directive to execute a suspected terrorist’s family members or engage in torture. If Donald Trump is elected, he will try to follow through on what he campaigned to do such as building a wall along the U.S.-Mexico border. The same midterm problems that could threaten the Democrats under a President Clinton, including a recession and a potentially unpopular president, could hurt the Republicans under a President Trump in 2018. While the Republicans would still have an advantageous Senate map in 2018, the GOP’s House majority could very well be endangered. The midterm trend against the president’s party in the House is even clearer than that in the Senate: There have been 39 midterms since the Civil War, and the president’s party has lost ground in the House in 36 of them. Finally, a third possibility for 2017 is that Trump is such an electoral disaster that Clinton not only wins the White House but she is also swept in with a Democratic Senate and House. Again, the chances of this are small, but certainly not unprecedented, as noted above. The next Democratic House majority, whenever it comes, probably will be the most uniformly liberal of modern times. The old conservative Democratic blue dog is essentially extinct, and the Democrats’ most plausible path to winning back a House majority involves winning battleground suburban seats as opposed to the conservative southern and Appalachian districts that Democrats used to hold. So one would not expect a future Democratic House majority to have a sizable conservative bloc. Still, even if Democrats won the House, they likely would be several seats short of a filibuster-proof majority in the Senate. This would give Senate Republicans the option of stopping big ticket Democratic policy proposals, such as an expansion of the Affordable Care Act or even a major legislative push to address climate change. This could lead the Democrats to simply do away with the filibuster, reducing the effective threshold for most action in the Senate from 60 votes to 51 votes. Yes, Republicans would vehemently oppose such a move, although there’s the possibility that they could eventually do the same thing (perhaps even during a period of unified Republican government under a President Trump). As Henry Olsen of the Ethics and Public Policy Center argues, the filibuster—and its frequent use—forces coalition government on two parties that have no interest in working in a coalition. It raises the bar for action to 60 votes when it is very hard for either party to win 60 votes in the Senate, and when there are relatively few senators who cross over to vote with the other party on many issues. The filibuster has already been eroded, including by the Democrats in 2013 when they eliminated it for most nominations in order to confirm a number of judges and other officials that Republicans blocked. Doesn’t it seem possible that its total elimination is just a matter of time, particularly as two increasingly divergent parties find themselves increasingly frustrated by its use? Perhaps that seems implausible. But we’re in an era where the first African-American president is set to be succeeded either by a reality television star or the first woman president. In American politics, things that at one time seemed quite implausible are now happening with some regularity. Kyle Kondik is managing editor of Sabato’s Crystal Ball, a nonpartisan newsletter on American politics and elections produced by the University of Virginia Center for Politics. He is also the author of The Bellwether: Why Ohio Picks the President.